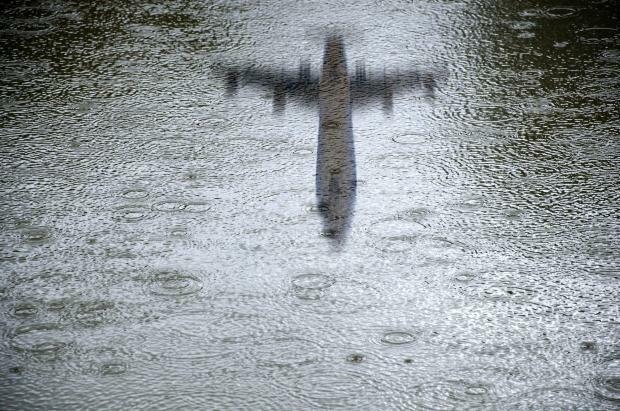 Registering a total of 99.8mm of rainfall, the first month of the year was three times as wet as the previous month, making it the wettest January the Maltese islands have experienced since 2011. The second week of January saw its fair share of precipitation, given that 12.6mm of rain fell on the 9th day, amounting to over 12% of the month’s above-average total rainfall. Malta was also rattled by six thunderstorms during January, five of which were reported between the 19th and the 28th. Hail was observed on four days, twice in the first week and twice in the last. This is double the climate norm. Despite the stormy spell, January recorded a lower-than-average mean cloud cover, allowing the islands to enjoy an average of 5.6 hours of bright sunshine per day. Characterised by a total of 174.5 hours of bright sunshine and a below-average mean air temperature of 11.6°C, the first month of 2019 was sunnier than expected, but started the year off on a cool note. Rainfall in January was above average. 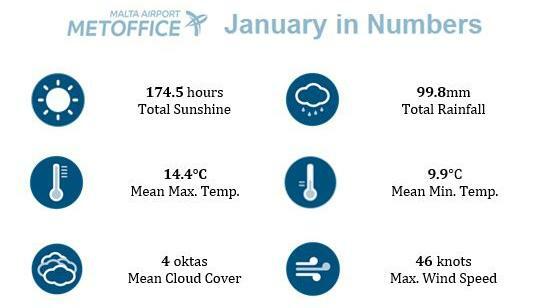 Malta didn’t escape the Polar air mass, which descended on continental Europe during the first week of January. A look at January’s weather pattern shows that the first half of the month was relatively cooler than the second. The lowest air temperature to be recorded was a crisp 4.1°C on January 5, while the grass minimum temperature dropped to a frigid 0.1°C two days later. Halfway through the month, air temperatures gradually started to rise, reaching a maximum of 17.8°C on January 18. At 14.4°C, the mean maximum temperature was over one degree cooler than the norm of 15.6°C. The mean minimum temperature was also lower than the climate norm of 9.9°C, dropping to 8.8°C. In contrast with cooler air temperatures, the mean sea surface temperature for this month rose by 0.3°C to 16.1°C. January was not only colder but also windier than expected, recording an average wind speed of 10.7 knots - 1.5 knots higher than the climate norm.